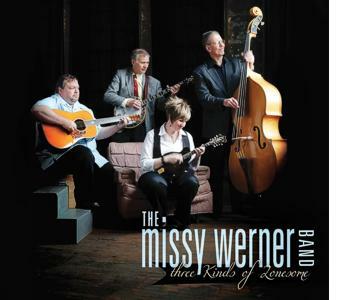 Missy Werner Releases New Single, "I Always Do"
As she works toward the release of her next album, singer, mandolinist and bandleader Missy Werner is offering the public a sneak peek with “I Always Do,” a new single drawn from the project. The song follows on the heels of her last album, Three Kinds of Lonesome. Read more about Missy Werner Releases New Single, "I Always Do"
With one acclaimed album-the Dwight McCall-produced Drifting And Dreaming (2009)-already to her credit, Ohio's Missy Werner returns on December 6th with a sophomore project that highlights her ear for an outstanding song. Recorded at The Rec Room in Nashville, with award-winning engineer Ben Surratt behind the board, Three Kinds Of Lonesome serves up 14 selections that include under-appreciated recent gems, old favorites and brand-new songs from some of the best of today's bluegrass writers. And while a handful of guests-Mike Witcher (dobro), Aaron Till (fiddle), Ned Luberetki (banjo on "If I Fall"), Jennifer Strickland (harmony vocals) and duet partners Frank Solivan and Chris Jones-contribute to the music, the spotlight falls squarely on Missy's veteran touring band (Jeff Roberts, Tim Strong, Artie Werner) and on her expressive voice.